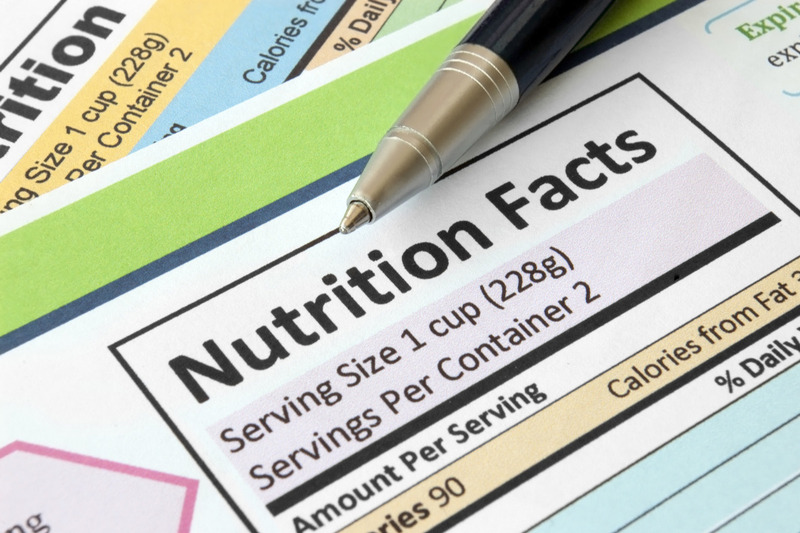 What is the world's most nutritious food? We don't know, exactly, but we have a good idea of where and how it would be grown: In highly fertile mineral-rich soil. 1.Food crops have been selected and bred for commercial goals such as appearance, uniformity, disease resistance, storage and shipping qualities, and above all yield. They have not been bred for nutritional content. 2. Soils have been depleted of essential minerals as the crops are sold out the farm gate, and the minerals have not been replaced. 1. Determine which existing varieties of food crops provide the most nutrients. 2. Encourage selective breeding with an emphasis on nutrition. 3. Test the soil for mineral content and amend any deficiencies so the soil has all it needs to grow nutrient dense food. Our research so far strongly indicates that the decline of vitamins and minerals in today's food is unnecessary and easily remedied. We believe it is possible to transform our food supply, in such a way that it contains even more nutrients than the food our grandparents and great grandparents had. The nutritional value of any crop can be increased simply by supplying any missing minerals to the soil the crop is grown in. Please have a look at the chart below. 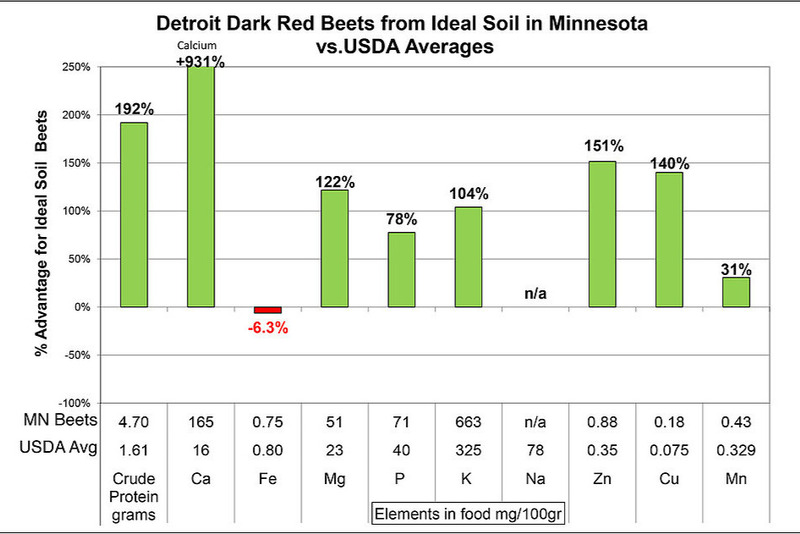 These beets grown in Minnesota were 931% higher in calcium and 193% higher in crude protein than the official USDA numbers. Brussel's sprouts grown by one of our researchers in Maine had 97% more crude protein and 229% more calcium. Like the beets above, okra grown in Maryland in 2010 tested well above average in all but one of the nutrients measured, but was exceptionally high in three essential trace minerals. This okra, grown in mineralized soil, contained 24 times more Iron, 27 times as much copper, and 33 times more zinc than the USDA average. Zinc is called the “intelligence” mineral and is essential for reproduction in both plants and animals; copper is crucial for the immune system, and we know that iron is needed to form red blood cells. Adequate amounts of all three are frequently missing from our depleted soils and our food as well. Almost across the board, all of the crops grown in mineral augmented soil far exceeded the government's official averages. Importantly, all of these results were obtained in the first year of soil amending. If these sort of results can be replicated consistently, that opens a whole new world of food as medicine. If we can grow food with two times or ten times the present amount of essential nutrients, we can feed more people, with better food, on less farmland than is presently cultivated. It's not how many tons of food that can be produced on a given area of land that matters, it's the amount of nutrients that food contains. We already know how to grow huge amounts of carbohydrates and empty calories. It's not that big a step to start growing food with huge amounts of real nutrition; it just requires changing the focus from bulk quantity to nutritional quality. How do we get from where we are now, to having the most nutritious food that has ever been grown? We need to forge a strong connection between the sciences of health and nutrition and agricultural science. We need to know how to work with Mother Nature and the soil so that every crop can achieve its full nutritional potential. What If there was little need for nutritional supplements, because anyone could get an abundance of all the nutrients they needed right in the food they normally eat every day? Imagine every child getting all of the essential nutrients they need to reach their full genetic potential. Our informal group has been studying the connections between minerals in the soil and nutrients in our food since 2010. A long-neglected website, NutrientDenseProject.com still remains online from our early days. You can find examples of our data and accomplishments there. Our “formal” research ended after the first year and a half. By fall of 2011 we had run out of volunteer labor and money for lab fees and were busy with other projects, but we didn't give up. Around a dozen of the original volunteer crew have stayed in touch and have continued growing nutritious food and experimenting with soil amendments. We have been joined by some talented new researchers as well. Another seven years of experience and observation have made us all better informed. The purpose of this research is to measure the variation in nutrient content among different varieties of the same fruit, vegetable, or grain, and to see how that nutrient content is related to the mineral content and overall fertility of various soils. To the best of our knowledge, a trial such as this has never before been done. There have been a (very few) trials measuring the variation in nutritional content of different varieties of vegetables (e.g. cabbages, lettuce, broccoli,) but we have found no nutritional research that includes soil test data and the effect of soil minerals on nutrient content. 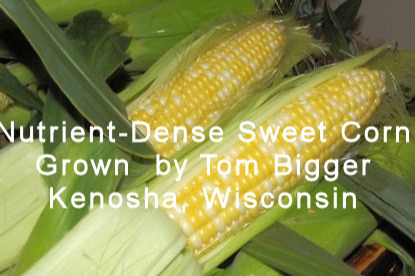 -Variation in nutrient content of the same variety grown in four different soil treatments. All lab reports will be made public on the SoilMineralUnderground.com site as they are received. It will be open source, free to use for any purpose (including commercial applications); everyone is welcome to help themselves to the data and reach their own conclusions. Where will the money go? Several growers who are experienced with soil testing and mineral amending have offered the use of an area of their farm or garden soil for these trials. The Soil Mineral Underground will pay for soil and produce testing and fertility recommendations by experienced consultants, provide or pay for any soil amendments, and hopefully be able to give the growers a monetary donation for their time and effort. We will select a few common garden crops to start with, for example broccoli, carrots, or green beans. The number of crops chosen and the number of trial areas will of course depend upon funding. We will choose several of the most commonly grown varieties of a given crop, those frequently grown commercially (or in home gardens) in the US. We will select between four and ten varieties of each vegetable. These will include open pollinated “heirloom” varieties as well as commercial hybrids. Each experimental plot will have the soil tested and fertility recommendations made by an experienced soil consultant familiar with both organic-biological and conventional-chemical agriculture. The Soil Mineral Underground group presently includes several professional soil consultants. Soil amended to SLAN (Sufficient Level of Available Nutrients) as recommended by a local county extension agent or agricultural college. Soil amended only with USDA organic-approved compost. Soil amended to the Ideal Soil mineral ratios following USDA NOP Organic rules. Each grower will have a single soil test done at the beginning, before any fertilizers or amendments are added, and four soil tests at the end of the growing season, one sample taken from each soil treatment listed above. Each grower will plant two or more plants of each variety in each of the four soil treatments. Growers will be responsible for amending the soil and irrigating and caring for the crops until maturity. At crop maturity each grower will harvest the crops and send labeled samples to the lab for testing. Growers are expected to keep records, at least to the extent of planting date, harvest date, and any fertilizers or other treatments applied to the plant or soil. If each grower sends in 2 samples from 4 different varieties of 2 different crops (e.g. carrots and green beans) from each of 4 soil treatments, that will require 64 crop nutrient tests from each grower (2 x 4 x 2 x 4 = 64). Each grower will have a single soil test before amending and another soil test from four different soil treatments the end of the trial; that will be a total of 5 soil tests per grower. Total estimate for testing, per grower, for two crop species = $2045. In addition to the lab fees will be the cost of fertilizers, shipping of samples and amendments, labor costs for crop production, data input to a spreadsheet, office supplies, website work etc. We are estimating that will add approximately another $3000 in expenses per grower. Total expenses for five researchers growing, testing and correlating results for two different crops is estimated at $25,000. We would end up with 25 unique soil tests correlating with 320 unique crop nutrient tests. At the end of each trial, the lab data will be reviewed to determine which crop varieties and which soil treatments produced the highest nutrient levels. All data collected will be published online and will be copyright free and in the public domain. Anyone who cares about health, nutrition, longevity, and quality of life: nutritionists, physicians, athletes, people with health problems, backyard gardeners, farmers (both conventional and alternative), anyone who cares about their own health and that of their family and community. We have no desire to start a business doing this. We only wish to create the beginnings of a free database that lists the most nutritious varieties of common food crops, and also a database that shows how the balance of minerals in a soil affects the amount of essential nutrients in various crops. Please help by supporting this research and spreading the word about the Soil Mineral Underground's Nutrient-Dense Project. $25 pays for a soil test, $30 pays for a plant tissue test, $5 pays the postage to send a sample to the lab. Any and all donations are greatly appreciated. This is science by the people, for the people; science that has never before been done. Your help can make it happen. In 1954, an American nutritionist published a new and different type of book titled Let's Eat Right (to Keep Fit). Let's Eat Right was a primer on nutrition for the layperson, written from a scientific perspective. The book's author, Adelle Davis (1904-1974), was a consulting nutritionist with manyl years of experience. She held a degree in dietetics from UC Berkeley (1927) and a Master's in biochemistry from USC (1938). Davis had been studying and working in the health and nutrition field since the 1920s and knew the scientific literature well. She took it upon herself to condense that knowledge and make it available to the common person. The 1950s was a time of great changes in American (and world) agriculture. The hybrid grains of the Green Revolution were being developed, adapted to producing large yields on little more than N, P, and K chemical fertilizers, while synthetic pesticides were being developed to control the ravages of insects and disease that these hybrid crops attracted. There was no EPA and little pollution control. Industrial waste and farm chemicals alike were dumped into the nation's waterways indiscriminately. It was a Brave New World and chemistry was its genie. 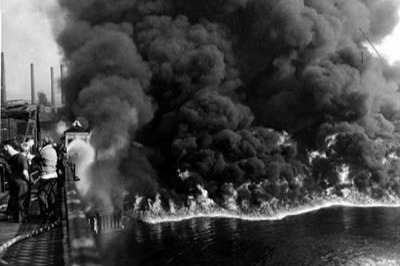 The Cuyahoga River in Ohio famously caught on fire in 1952, causing five deaths, but it wasn't until the massive Cuyahoga River fire of 1969 (after television) that any national moves were made to control industial pollution. The Cuyahoga River wasn't the only flammable waterway: The Rouge River caught fire in Detroit the same year, and the Buffalo River in Buffalo, NY blazed in 1968. Largely due to to widespread publicity of these disasters, the Clean Water Act was passed in 1972. But the 1950s and '60s were also the era that led to Rachel Carson's Slent Spring, documenting the ecological damage and consequences of powerful insecticides like DDT. These times saw the rapid growth of the organic farming and gardening movement popularized by J I Rodale in his Organic Gardening magazine. Aldo Leopold published his A Sand County Almanac in 1949. These years saw the inception of our modern environmental awareness. In the midst of this change and conflicting visions of the future, Adelle Davis' Let's Eat Right found a ready audience. She found a way to combine the best of the discoveries of nutritional science from the previous half century, with an awareness of the dangers of chemical pollution. She advocated for whole foods and against refined and artificial foods, while explaining what foods to eat and what vitamins and minerals to supplement the diet with in order to achieve optimum health. She was making the point that if it's not in the soil, the nutrient can't be in the plant, and can't be in the fruit of the plant. Not all apricots have the same nutritional value. A plant food can contain no more nutrients than are made possible by the fertility and minerals available from the soil in which it is grown. At least, that is what we believe, those of us promoting this research. The quest for nutrient dense food should have been taken up in the 1950s, but it wasn't. The only metrics that have been measured over the past seventy or eighty years are yield and appearance. Most of “alternative” agriculture remains focused on simply avoiding the use of synthetic chemicals. No thought has been given to actually measuring the nutrients in the food grown. No thought has been given to correlating the minerals in different soils with the nutrients in the crops. No effort has been made to select and breed more nutritious crops. Little effort has been made to figure out how to amend soils so that the crops produce the nutrients desired in the amount desired. We read that spinach is a good source of Iron, and broccoli a good source of Calcium. Are they really? What if they have been grown in an Iron-deficient or Calcium-deficient soil? Which spinach, which broccoli, grown where? We are proposing to do this research and crop trials on a shoestring budget. Most of the funds will be earmarked for paying lab fees. The experts have told us that it would cost $500,000 to do this. We think we can gather significant data, enough to prove the validity of this approach, for $25,000. We believe that our work and results will inspire and encourage others to carry this work forward and spread the knowledge of how to grow nutrient dense food: How to create a soil that allows plants, and the animals and people who rely on them, to reach their full genetic potential. Please donate what you can to this project. $25 will fund a soil test or a crop nutrient test. All of what we learn, all of our data and lab results will be shared, first of all with our supporters, and eventually, we hope, with nutritionists, gardeners, farmers, physicians, athletes, and all who care about health and nutrition around the world. The goal of this research is to measure the variation in nutrient content among different varieties of the same fruit, vegetable, or grain, and to see how nutrient content is correlated with the mineral balance, organic matter content, and exchange capacity of various soils. To the best of our knowledge, a trial such as this has never before been suggested or done. There have been a (very few) trials* measuring the nutritional content of different varieties of vegetables, e.g. cabbage and lettuce, but we have found no nutritional research that includes soil test data and the effect of soil mineral amendments on nutrient content. We will choose several of the most commonly grown varieties of a given crop, those frequently grown commercially (or in home gardens) in the US. We will select four varieties of each vegetable. These will include open pollinated “heirloom” varieties as well as commercial hybrids. The experimental gardens will be located in different climatic areas of the US, for example NE, Mid-Atlantic, Deep South, Southwest, Maritime NW, and Midwest. 2. Soil amended to SLAN (Sufficient Level of Available Nutrients) as recommended by a local county extension agent or ag college. 3. Soil amended with USDA organic-approved compost. 4. Soil amended to the Ideal Soil mineral ratios. Each grower will have a single soil test done at the beginning, before any fertilizers or amendments are added, and four soil tests at the end of the growing season, one test sample taken from each soil treatment listed above. Each grower will plant four or more plants of each variety in each of the four soil treatments. Growers will be responsible for applying amendments to the soil and irrigating and caring for the crops until maturity. At crop maturity each grower will harvest the crops and send a labeled sample from the best two specimens of each variety to the lab for testing. Growers are expected to keep records, at least to the extent of planting date, harvest date, and any fertilizers or other treatments applied to the plant or soil. A chain of custody will be maintained for all lab samples, both soil and plant tissue. The Mehlich 3 soil test will measure the elements S, P, Ca, Mg, K, Na, H+, B, Fe, Mn, Cu, Zn, and Al along with pH, soil organic matter, and estimated CEC (Cation Exchange Capacity). The F5 Feed analysis will test for the same elements as the soil test and also for moisture content and crude protein. In these trials, we are testing only for minerals, not vitamins or phytochemicals, because minerals are stable and will not decompose or lose potency from the time of harvest until final testing. The sample could rot or dry out and it would not change the mineral content as a percent of dry matter. All vitamins and phytochemicals have mineral co-factors. We know that if the plant has a good supply of minerals it will be able to synthesize all of the vitamins and phytochemicals that it typically produces. The minerals, in this case, serve as an indicator of likely phytochemical content, as well as fulfilling their normal role as essential nutrients. By testing only for minerals, we eliminate the risk of the samples degrading during transport. Using an animal feed test from an agricultural laboratory rather than a FDA certified people-food lab also significantly lowers testing costs while greatly increasing the amount of samples we can afford to test. Two plants each of four varieties will be grown, harvested, and analyzed, from each of four differently amended soils; that will total 32 plant tissue samples per crop to be sent to the lab. If each experimental garden trials two types of produce, e.g. broccoli and carrots, each garden will be sending 2 x 32 = 64 plant tissue samples to the lab. Each grower will have a single soil sample tested before amending, and one from each of four treatment areas at the end of the trial, that will be a total of five soil tests per grower. (This is a very reasonable cost for the amount of samples being tested. Using an agricultural lab and the animal feed test @ $30 per sample is drastically cheaper than sending the samples to an FDA approved food testing lab. (An FDA lab would likely cost $500 per crop sample. 64 samples x $500 would be $32,000 per grower.) Though we won't end up with FDA certified labels on our results, we will gain a massive amount of data from each trial garden. The Project will supply all soil amendments from a central source to ensure that all fertility inputs are identical. The Project will also supply all seeds. Estimated cost for seeds and fertility amendments, including writing the soil Rx, custom blending the SLAN and Ideal Soil mixes, and priority mail shipping, is $350 per garden. Our estimated total for soil and plant testing, plus supplying amendments, is $2,740. We also need to include a donation to the growers for their time and effort, plus a donation to those who will be correlating and consolidating the data received from the lab and posting it on the internet, plus ordinary business expenses for office supplies etc, We estimate this will add another $2,260 in expense, for a total of $5,000 per trial of four varieties of two different crops. If five growers participate in the full trial, the cost will be $25,000. 320 unique plant tissue tests listing their mineral content of 11 elements, plus crude protein, of between 5 and 20 different varieties of each crop (depending on whether all growers trialed the same varieties or all grew different varieties in their various climates and locations). At the end of each trial, the lab data will be reviewed to determine which crop varieties and which soil treatments produced the highest nutrient levels. All test results will be published online and will be copyright free and in the public domain. We encourage everyone interested in nutritional science to support this research and to make use of the coming treasure trove of unique information. Is this research important? We think it is as important as anything happening in the world today. It has the potential to change the health and ecology of the whole planet and all of society. Despite the obvious scientific value of comparing soil minerals to food crop minerals, the research has never been done. There have been plenty of assays of food crop nutrients, millions of them. We have also had millions of soil and mineral tests. The health and nutrition fields know a huge amount about the nutrient composition of foods grown all over the world. The the fields of agronomy and geology know the mineral composition of soils all over the planet. The problem so far is that there is no connection or communication between agriculture and nutrition. 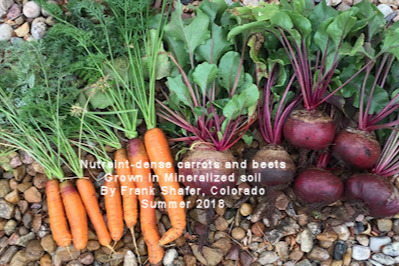 Neither the farmers nor the nutritionists are aware that the balance and amount of soil minerals directly affect the nutrient content and health of the crops grown. Even if that concept is understood, neither realize that it can be easily manipulated. There is little or no chance that establishment agronomy, medicine, or food processing and distribution is going to fund this research, much less actually do the research. If it is to be done it will be done by independent researchers. If it is to be funded that will have to come from ordinary people who see the value in it. This research will tie nutrition and agronomy together, for the first time, by measuring the mineral content of a food crop and directly correlating that to the mineral composition of soil that has been amended in four different ways. Do plants grow better and synthesize more nutrients in a balanced, mineralized soil? Of course they do, just as each of us grows better and is healthier when our body minerals are at optimum levels and balanced. Is there other knowledge out there that is so superior that it wouldn't matter if this work disappears or was never done? Not a chance. This is basic chemistry, physics, and medicine. It can be the foundation for a new world. Without this strong and healthy foundation there is nothing to build a better world on. What good would it do to reform government and politics and religion and society in general if the planet is filthy with pollution and inhabited by unhealthy people whose brains don't function and whose children are sick and confused due to malnutrition and a toxic environment? Many thanks to those who have contributed. If any readers would like to help us fund this, please make a donation, no matter if it's small.We would rather have a thousand five-dollar donations than a single five thousand dollar donation, because that would indicate wide support from many smart and curious people. Many thanks to you wonderful people who have donated to this important project. We have raised $595 in 6 days. That's enough to pay for 23 soil assays or 29 crop nutrient tests. People are seeing that this knowledge is important to our health. Seeing the possibilities. 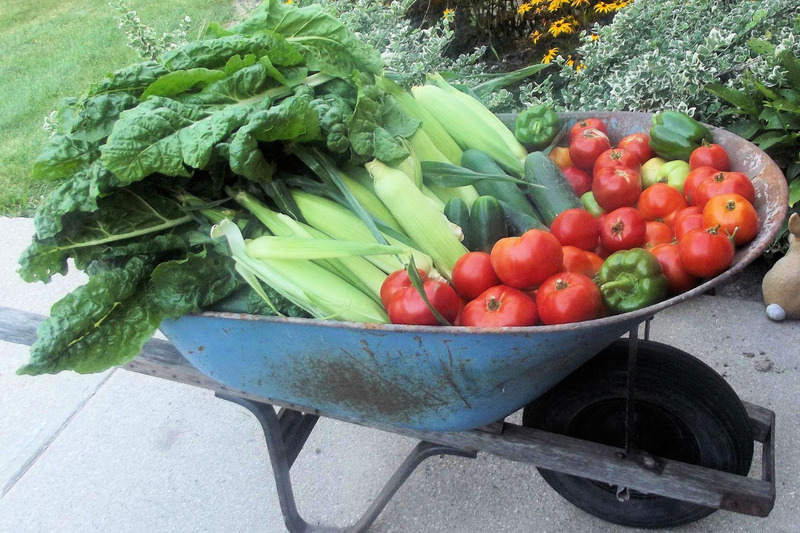 We can grow prescription food, food that has a known amount of nutrients. We can grow the most nutritious food that has ever been grown. This is science by the people for the people. This info tying together soil minerals and plant nutrients has never been gathered before, Remember all of this data will be freely shared, and you are welcome to use it in any way you like, whether that be growing nutrient dense food, healing with supercharged herbs, or starting a new web business. Incredible possibilities here. Let's do it. If you haven't donated yet, please consider chipping in. $5 will take us to the $600 mark!